At various points I have bought things on Kickstarter. I've basically stopped for now as I was spending way too much money on all the various projects that would get posted and looked neat. As I am a fan of comics, I of course have given money to intriguing comic projects before. Some things are super-independent and the copies I got were the only ones that were ever made. Other things were done in a way where you could go out and buy the comic now as it got funding through Kickstarter but was published on the scale of at least being purchasable on Amazon. 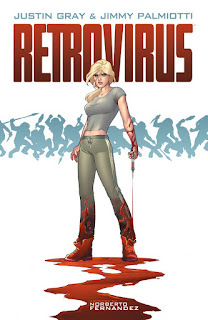 Retrovirus is one of those comics. I like Jimmy Palmiotti, and he and Justin Gray wrote this. 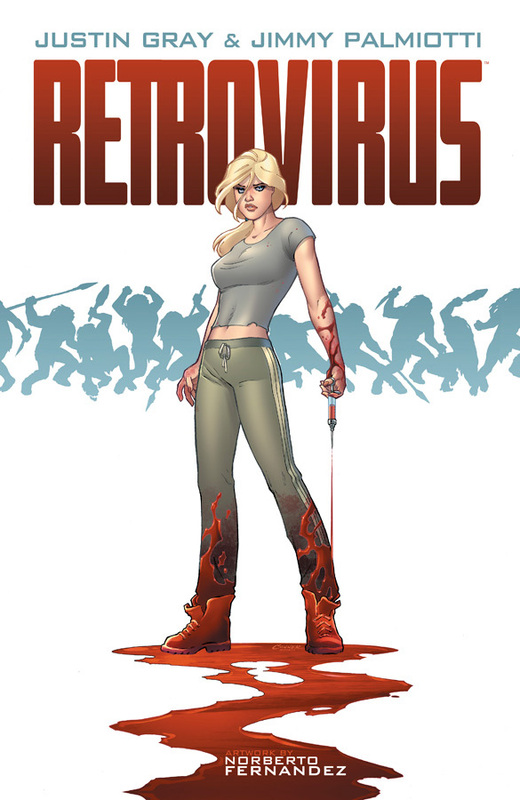 The art was provided by an individual named Noberto Fernandez, with Amanda Conner supplying the gross-yet-cool cover. Conner is a gifted illustrator and Palmiotti is lucky to have her as his wife as I assume that means he doesn't have to pay her for her great work (of course, if he illustrates anything she were to write and he drew, it would mean she doesn't have to pay him, so its a two-way street, I suppose). The insides of the book aren't as amazing as Amanda Conner's stuff, but still pretty good. 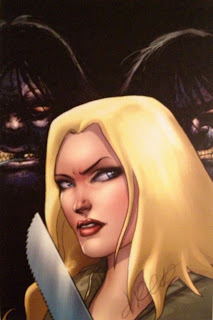 Fernandez has done work for adult comics and it shows with the way he seems to have a tendency to pose our title's heroine, Zoe Wallace, in a suggestive manner. Although, when violence breaks out--and there is plenty of it--Fernandez illustrates that well too. As for what the story is about, I won't spoil too much but will give you an outline. Basically Zoe Wallace is a gifted scientist who specializes in retroviruses, or viruses that insert themselves into the body's very own DNA strand, wreaking havoc (HIV/AIDS is the best known example). She is offered a job working on something top-secret for a big pharmaceutical company and upon accepting it learns there is a perfectly preserved caveman who has an ancient infection. This would be great news except the scientists have all been exposed to the virus as it is airborne and screws up reproduction due to birth defects and infertility. This upsets Zoe whom we learn is in fact pregnant. Therefore much effort is spent trying to find an antidote, the company everyone is working for has dark intentions, and some Caveman have been made too and they aren't very nice. They breakout, trouble ensues, and while the ending is happy a lot of visceral bloodshed happens first. All-in-all its a good time. Plus, the, "thank-you," note from the creators gave me a warm, fuzzy feeling knowing I was helping people do projects they may not have otherwise been able to embark on due to costs and such. I enjoyed this book, and the extra perks of supporting it through Kickstarter were great too. You can currently buy this at a comic shop or via Amazon (if you don't have a shop nearby, which would be sad) and it is well worth a read-through.